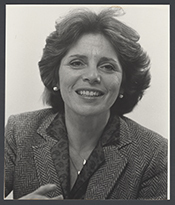 ROUKEMA, Margaret Scafati, a Representative from New Jersey; born in Newark, Essex County, N.J., September 19, 1929; graduated from West Orange High School, West Orange, N.J., 1947; B.A., Montclair State College, Montclair, N.J., 1951; graduate work, Montclair State College, Montclair, N.J., 1951-1953, and Rutgers University, New Brunswick, N.J., 1975; teacher; Ridgewood, N.J., board of education, 1970-1973; unsuccessful candidate for election to the United States House of Representatives in 1978; elected as a Republican to the Ninety-seventh and to the ten succeeding Congresses (January 3, 1981-January 3, 2003); not a candidate for reelection to the One Hundred Eighth Congress in 2002; died on November 12, 2014, in Wyckoff, N.J.
Margaret (Marge) Roukema in Women in Congress, 1917-2006. Prepared under the direction of the Committee on House Administration by the Office of History & Preservation, U. S. House of Representatives. Washington: Government Printing Office, 2006.